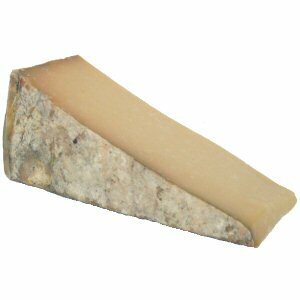 This Clothbound Cheddar is made by Cabot Creamery, bandaged with muslin and skillfully aged 10-12 months at the Cellars at Jasper Hill, nearby Greensboro, Vermont. 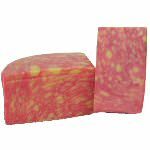 This gourmet cheese is a handsome natural rinded traditional cheddar, simple, approachable and balanced, with layers of lingeringly nutty, slightly fruity and nearly buttery flavor, while finishing with the mellowness of caramel undertones. 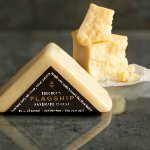 Made from pasteurized milk, this cheddar has flavor notes typically attributed to raw milk cheeses; it has all the characteristic texture of an English-style cheddar. Cabot's Clothbound Cheddar won a Gold Medal at the 2004 World Cheese Awards in London and was awarded 'Best of Show' by the American Cheese Society in 2006 and a second place its category 'All Cheddars, all milk sources' in the Competition of 2007. 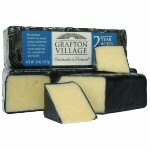 In 2009 this gourmet cheese obtained a second place in the American Cheese Society Competition in the Cheddars Wrapped in Cloth or Linen Category. Ingredients: Pasteurized milk, cheese cultures, salt, enzymes.